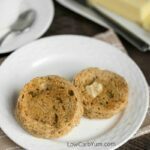 An easy recipe for fluffy gluten free low carb coconut flour pancakes. Such a tasty breakfast treat! Enjoy them with your favorite syrup or eat them plain. Pancakes are such a great weekend breakfast treat. 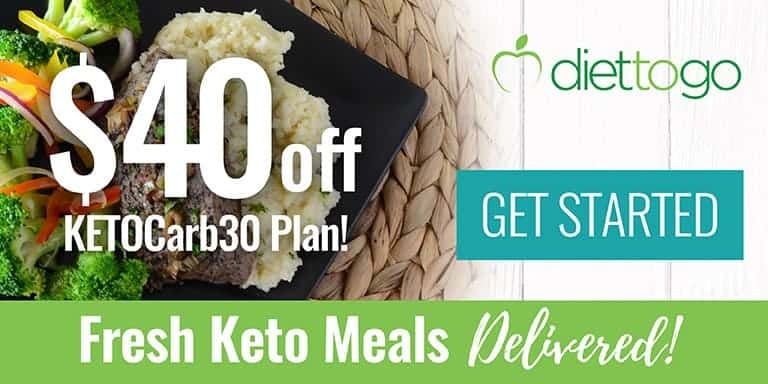 And, it’s great that you don’t have to give them up on a low carb diet. 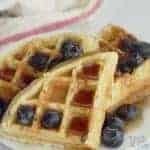 These pancakes use coconut flour, but you can also try my popular almond flour pancakes recipe or any of my other low carb pancake and waffle recipes. I decided to try a low carb pancakes recipe using coconut flour. There are a lot of people with nut allergies who can’t have almonds. Flour made from defatted coconut is a terrific option for those who need a nut-free recipe. These gluten free low carb coconut flour pancakes turned out lighter than the almond flour ones. And, they don’t have the nutty flavor of the almonds. What do coconut flour pancakes taste like? 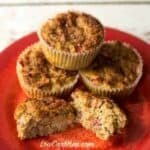 A lot of people shy away from coconut flour because they feel it gives things a coconut flavor. 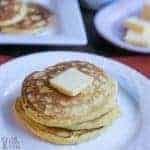 If you are very sensitive to certain tastes, I suppose that could be true, but I didn’t find these low carb pancakes to have a strong coconut flavor. 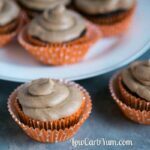 The recipe includes vanilla extract and low carb sweetener. Both of these can mask any coconut taste. Adding a little cinnamon can do the same. 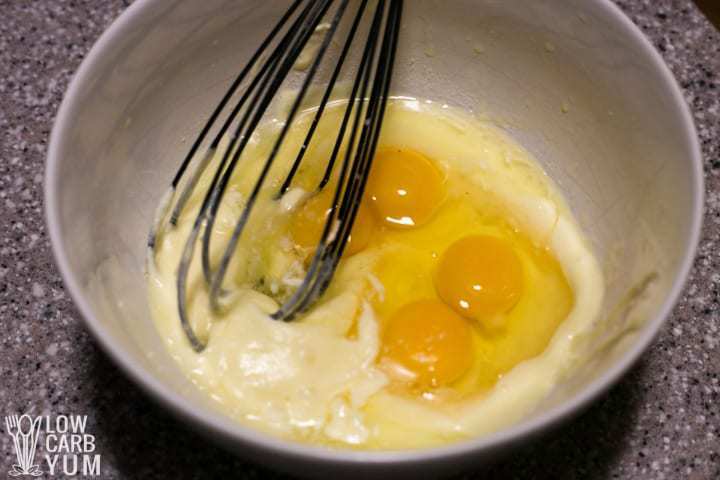 I typically use four eggs in the recipe, but the batter can be made with only 3 eggs if you find it has an eggy taste. However, some coconut flour tends to be more absorbent than others so I recommend adding in another egg if that’s the case. But, if you feel it would give a strong egg taste, you can try adding in some water or additional cream. And serving the pancakes with butter and low carb maple flavored syrup makes them taste just like regular ones! It’s super easy to make low carb pancakes with coconut flour. My recipe starts by whisking together melted butter, cream, stevia, salt, eggs, and vanilla extract in a medium bowl. Then, I add in coconut flour and baking powder. A little sparkling water can be used as well. The batter should be thick. It’s best to cook the pancakes on a griddle or in a large skillet. I like using an electric griddle with the temperature dial set at 325°F. About 3-4 tablespoons of batter are used for each pancake. The batter can be poured right onto the cooking surface from a spouted bowl using a rubber spatula to push it out. But if you don’t have a batter bowl, just use a spoon or a ladle along with a small rubber spatula. The pancakes should be ready to flip when the edges appear dry and the top is bubbling. 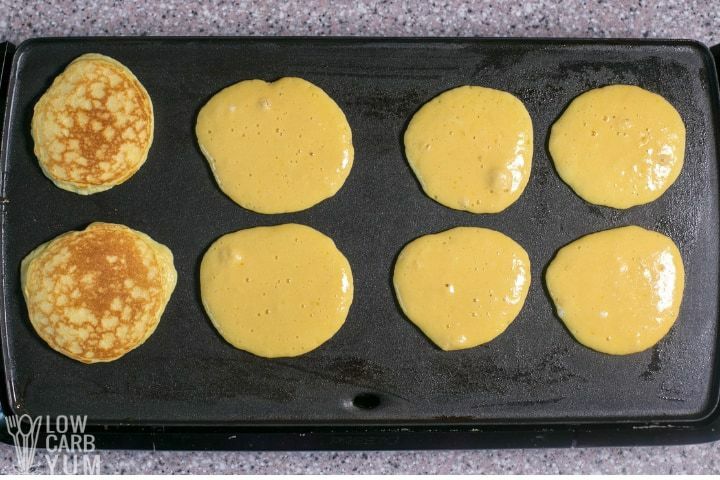 Use a quick motion to slide the turner spatula under each pancake then give it a flip. Be careful not to brown the sides too much. 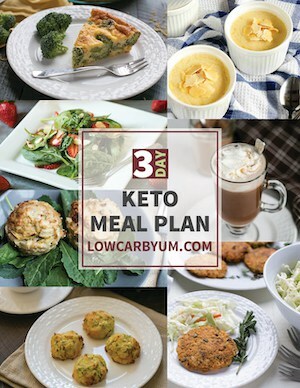 Need more help making the recipe? Watch my cooking video to see how easy it is to make these delicious coconut flour pancakes for you and your family. 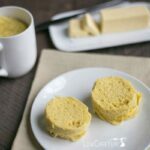 But note that an incorrect measurement is given for butter in the video so use the measurements provided in the printable recipe card on this page. When using coconut flour, you’ll need to add a bit more liquid and eggs. That’s because it acts like a thickener and can absorb a lot of liquid. However, you don’t want a thin batter that pours easily from a ladle or batter bowl. Some may prefer a thinner batter, but it tends to result in flatter pancakes. That’s why I keep my batter thick. I tried using almond milk, but the batter was way too thin and resulted in flat hotcakes. So be sure to use heavy cream or sour cream for the fluffiest pancakes. Additional baking powder or using a little sparkling water can also make low carb pancakes fluffier. If you want to make a large batch for quick breakfasts later, go ahead. I always double or triple the recipe since I already have the griddle out. My coconut flour pancakes freeze very well. And when you are ready to eat them, there’s no need to thaw. Just pop a frozen stack in the microwave to reheat any time you want! Want perfectly round pancakes? Then use a round pancake ring. It’s ensures that you get a perfect circle every time! However, I find just using a ladle results in pretty even circles. Keep the pancake size small. This makes it easier to flip them. Making silver dollar sized pancakes that are about 2-3 inches in diameter work best. The batter should be thick and not pour easily. If it’s too thick, an extra egg can be added or more liquid such as heavy cream or water. If the batter is too thin, just add in a little more coconut flour. And be sure to keep an eye on the pancakes when they are cooking so they don’t burn! I’ve been eating the almond flour pancakes for a while, but I like the lighter texture of these low carb coconut flour pancakes. 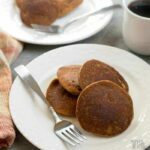 If you like restaurant style pancakes, you may want to try my oat fiber pancakes which use buttermilk. 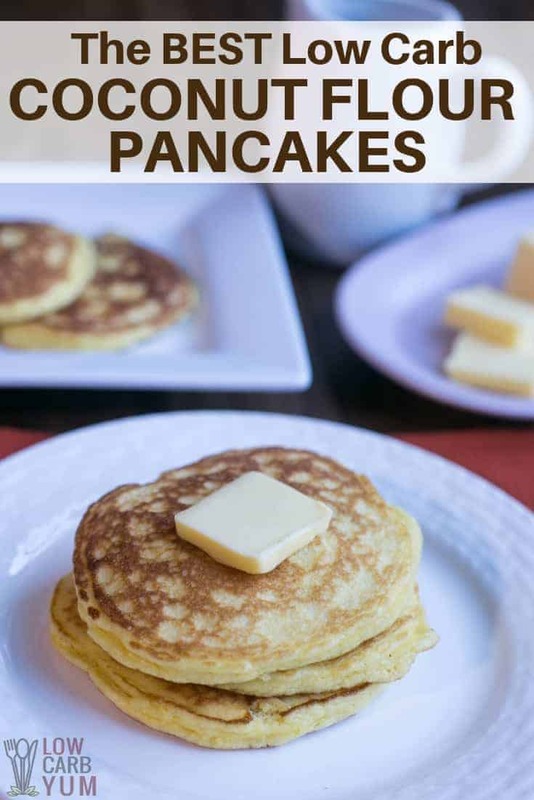 For keto pancakes with the least carbs, try the cream cheese pancakes or the flourless pancakes which have only 2 grams of net carbs for the whole batch. Love coconut flour? 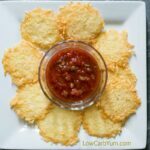 Check out this low carb recipe collection using the flour. It’s got some fantastic bread, muffins, and cakes you can make. 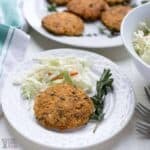 Or take a look at these recipes using coconut flour if you need more ideas. 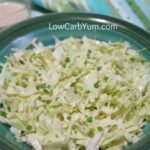 I’m always looking for new ways to use this amazing low carb ingredient. What’s your favorite coconut flour recipe? And, what do you like most about it? For me, it’s my low carb chocolate cake. I make it for all the family birthday celebrations. If you try these pancakes, I’d love to know what you think about them in the comments. Or, if you end up making changes for better or worse, I’d like to hear those too. 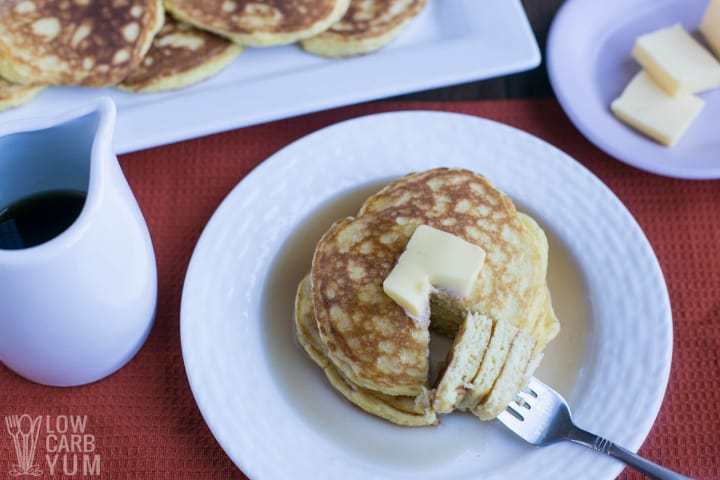 This easy recipe for fluffy gluten free pancakes is a tasty breakfast treat. 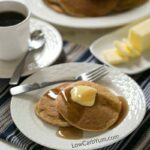 Enjoy these low carb pancakes with your favorite low carb syrup or eat them plain. 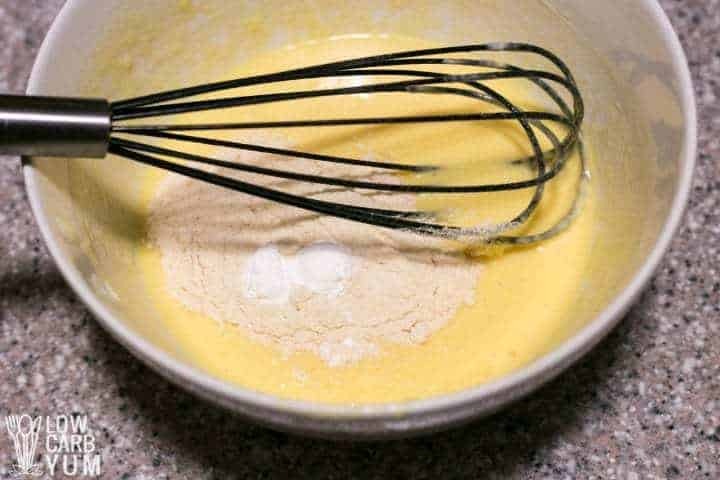 Whisk together butter, cream, stevia, salt, eggs and vanilla extract. In another bowl, combine coconut flour and baking powder. Mix dry ingredients into the wet ingredients. Let batter sit to thicken (15-30 minutes may be needed). Lightly oil skillet and heat over medium heat. Spoon heaping tablespoons of batter onto skillet to make pancakes about 2-3 inches in diameter. Flatten out the thick batter a bit with the back of a spoon to form flatter rounds. Be sure to check out the recipe video on YouTube for more useful tips on the recipe! Original recipe called for 4 eggs, but experience has shown 3 is better and makes the pancakes less eggy. Also, additional cream can be added if batter is too thick. Makes 12 small silver dollar sized pancakes. 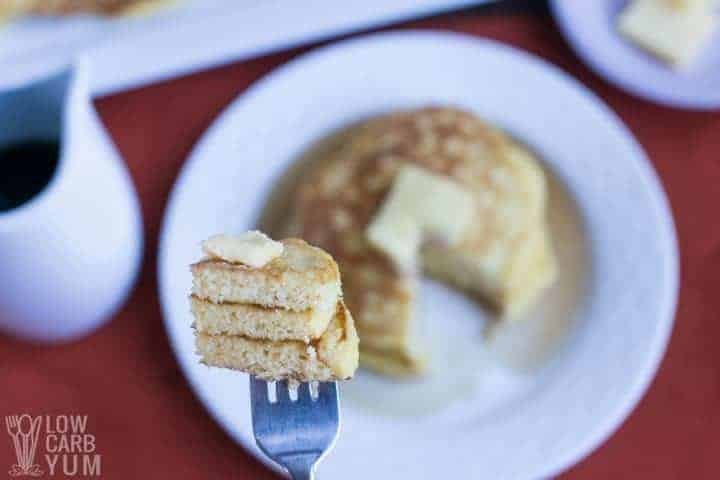 You'll get fewer pancakes if the size is bigger than 2-3 inches wide. The batter should be thick and it will thicken as it sits. Because it's a thick batter, after placing on the griddle, it should be flattened out a bit with the back of a spoon as needed. If the outside browns up before the inside cooks, your cooking temperature is likely too high. Test with a small single pancake before adding more to ensure the the temperature is right. This is also a good test to make adjustments to the batter if needed before cooking the entire batch. Be sure to read the text and watch the tutorial video above the recipe card for more tips on making perfect pancakes. Post updated in January 2019. Originally published September 2010.